The first time I heard the term “sacrifice pad”, I was horrified. I thought it meant a big cement pad used for slaughtering on the farm. It is NOT that. A sacrifice pad simply means an area of the farm you sacrifice to the cattle for winter. 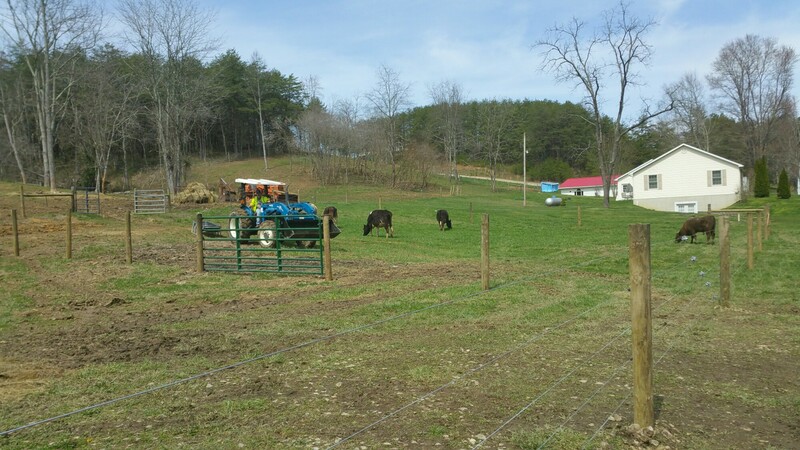 It winds up being a spot where not much grass will grow because the animals are on it so much during the winter. We have an excellent spot all around the barn for a sacrifice pad. 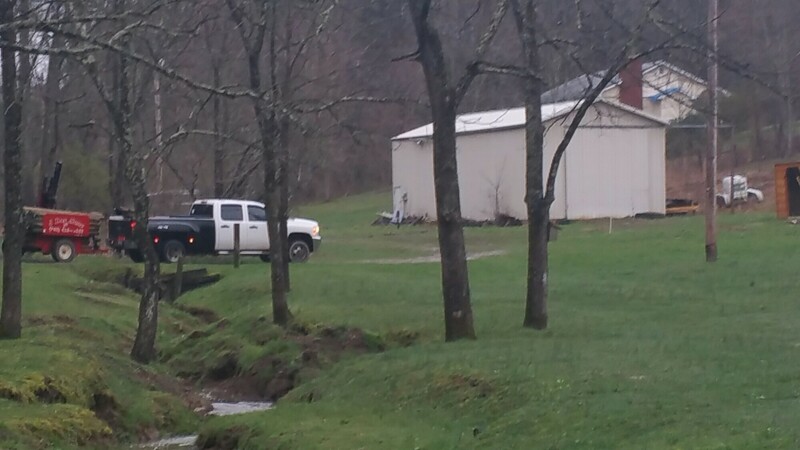 This barn was used as a garage to work on semi trucks before we purchased it, and the base is all gravel and large rock for twelve inches down, covered with a thin layer of topsoil and grass. That gravel layer is excellent because it means the mud won’t be knee deep in our sacrifice pad next winter, and having that area means our pastures can be shut up and rotated to allow winter rye to take hold and grow for the cattle (which helps with the feed bill!). This order of Amish doesn’t allow their pictures to be taken, but Mr. Keim said I could snap one of the post driver! 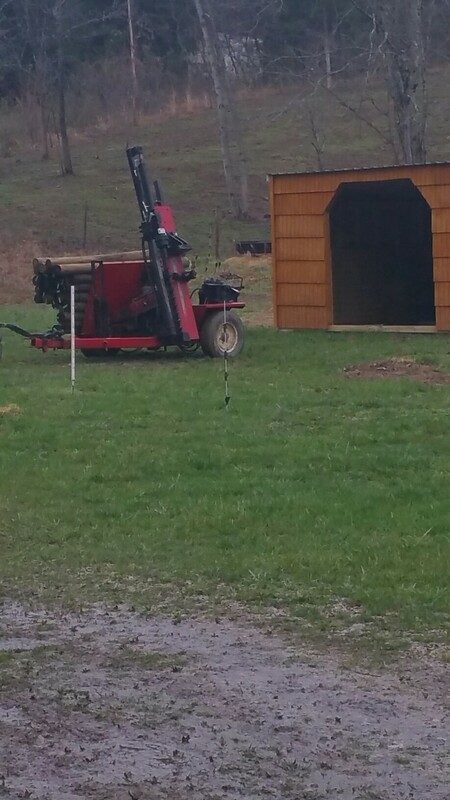 Before we went to pick up the new bull calf last Saturday, we drove over and picked up the local Amish fence builder, his young son, and his gas powered post driver along with his fencing materials. We dropped him off at our farm, went over the fence plan with him one last time, and headed north to pick up Chip. While we were gone, Mr. Keim built our sacrifice pad and set posts for the new headgate and sweep system (coming sometime this spring which we are BEYOND EXCITED ABOUT!!!). We got back with Chip just as Mr. Kim and his young son were finishing up the new fence. It was perfect timing! They wanted to see Chip, and his son climbed right up and over a post! That little boy just shimmer right up it and over it! That was funny to see (and made me feel quite old). As we took them home Saturday evening, Ted asked Mr. Kim about how the Amish communities are governed, and he told us all sorts of interesting things about their church and their school. We were fascinated. Once we dropped them off, we came straight back and introduced Chip to the girls. Bessie herded him from the paddock to the water trough, and Ted and I hung the two gates to enclose the new area in case Chip busted through the fence (so he’d still be contained).